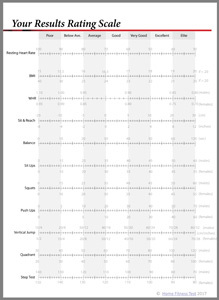 We have created a unique rating scale for use with the home fitness test. 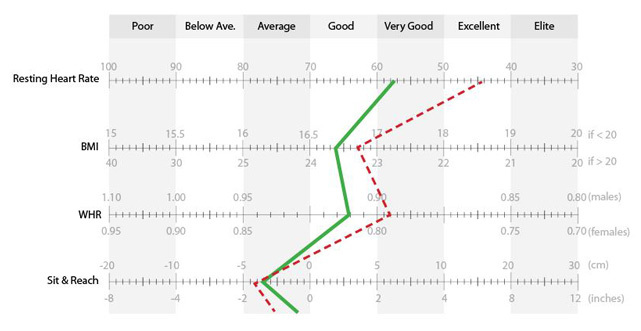 Once you have performed all of the tests and have your results (use our recording sheet), you can plot them on the scale, connect the points as shown on the example below, to clearly see where your strengths and weaknesses lie. You can use the same sheet for further testing which make it easy to see where changes have been made. In this example, you can see that there have been improvements with the second test (dotted line), except for sit and reach flexibility. The ratings (from poor to elite) are based on scores for adults, though the chart can be used for all ages to record and monitor changes in scores over time (just pay less attention to the ratings). While the rating scale was created for healthy young adults (e.g. 20-35 year olds), older and younger people can still use the scale which should still reflect the strengths and weaknesses, and provide a baseline for future testing. Transfer the results from the data recording sheet to the rating scale. Take care to mark the line at the appropriate place for each result. Note that the scale is not always consistent between marked points. Also, some tests have different scales for males and females, while others will have the choice of a metric and feet/inches scale. Click HERE to download the printable rating scale pdf.